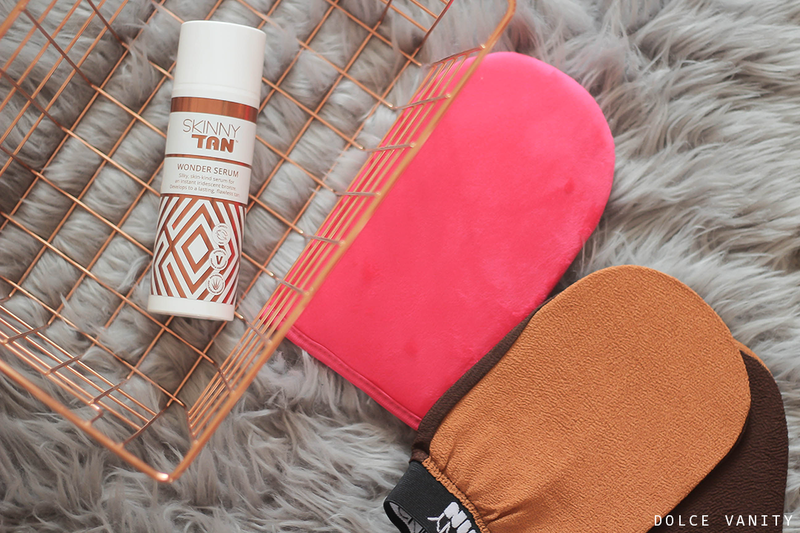 Skinny Tan is a brand that I have used previously before which you can read here, so given the chance to try a new product by them that’s exclusive to Boots. I thought why not? We are in Spring now and the days are randomly bright but they are still bitterly cold. The newest product from Skinny Tan is their Wonder Serum. It claims to be “a fast acting, easily absorbed hydrating silk serum that helps you look younger”. This can be used on the face and body, it’s an anti-aging treatment that allows for glowing, tanned younger looking skin that’ll last up to 10 days! They say it applies fast and dries in 2 minutes. With 95% naturally derived ingredients, cruelty-free and suitable for Vegans – it’s perfect for all! This tan should help cover blemishes, hide the appearance of cellulite, evens out skin tone and develops over 8 hours to give a rich, natural streak free colour. Really all I’ve got to do is put it to the test!! I’ve been mourning the loss of my tan from last Summer for months now so let's see how good the faux tan is. I decided to use only a salux cloth to exfoliate the skin because most the body scrubs that I currently use are quite moisturising and leave a film on the skin. The exfoliating mitt provided is the best option to get dead skin off and prep my skin for the Wonder Serum. Rookie-non-rookie mistake, had legs waxed decided to shave and my legs aren't as smooth as they should be albeit a little irritated. So I decided to give it a few days of exfoliating and to give my legs a bit more time to heal. Having never used a serum tan formula before, I noticed you do have to work quite quickly with this but you do get a nice colour guideline to know where you have applied the tan which is helpful. It also has specks of glitter within the formula which gives a nice radiant appearance. It dries down quickly but not that quickly that there's no transfer so be mindful of that as my white towel and sheets could tell you if they talked lol. I applied this tan about 5-6pm and I could see it develop and become a nice brown healthy shade. The second day it was a little darker but the third day, it had more of an orange tinge but one thing I am constantly doing is exfoliating just to take it down a notch but to be fair that was my fault as I kept applying and applying not thinking - wait until it develops and do it again. As the orange tinge has it screaming 'FAAAAAAAAAAKE' well that and the fact, I've not been on a holiday and it's been grey and miserable in the UK. I'm not sure if this is a positive or a WTF? But my boyfriend couldn't tell I had on a fake tan, so it's either very natural and healthy looking or it did nothing for me. Although oompa loompa day he noticed and pointed it out around my ankles lol so that's more a FFS than WTF moment. Without a doubt, I quite like the serum formula, over a liquid or a foam - well in hindsight not too much difference from a lotion, this is just a bit more lighter in texture. The colour guideline it gives, also the smell of fake tan isn't as prominent as other brands. When applied there's very little of that familiar biscuit smell but when it's beginning to develop, I could smell it the next day as could my sheets. Nothing a wash of those and myself, with a scrub couldn't take down. But if you're a tan lover or a newbie, I would recommend at least trying this one out, I don't think many will be disappointed!